Josephus (ca. 37–ca. 100 CE) was an early Jewish historian whose works provide a glimpse into Jewish history as it was understood in the first century CE. SBLHS 2 §8.3.7 includes guidelines for citing the works of Josephus. This post updates those guidelines and provides additional resources. SBLHS 2 §8.3.7 provides two sets of abbreviations for Josephus’s works, one based on the Latin titles and one based on common English titles. Offering two sets of abbreviations can be confusing, especially in multiauthor essay collections, as authors wonder which of the two they are to use in a given context. To promote clarity and to bring SBLHS’s preferred style for Josephus into conformity with the treatment of other ancient works (see §8.3.14), we are revising the guidelines to promote a single set of abbreviations based on the Latin titles. English titles are provided in the chart below only for reference. As with our changes to rabbinic abbreviations (see our post here), by stating that we are instituting a single set of abbreviations for the titles of these works, we are not implying that the alternate way is incorrect. 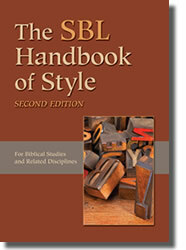 We mean only that, for the purposes of SBL style, the Latin-based set is strongly preferred. For the record, SBL Press prefers the first option because it provides both elements of an effective citation system: brevity and specificity. B.J. 3.10.7 in the Whiston system equals B.J. 3.506–515 in the Niese system. If brevity were the only goal, one might prefer the Whiston system, which has fewer numbers in this instance. However, specificity is also crucial, which tilts the scale in favor of the Niese system. For example, a reference to the second mention of the Jordan River within Josephus’s paragraph is much easier for readers to find when it is given according to the Niese system (B.J. 3.515) than with the Whiston system (B.J. 3.10.7), which requires readers to read the first three hundred words of the paragraph, past the first mention of the Jordan, before finally arriving at the sentence in question. Therefore, although the Niese system will not always produce a reference briefer than the Whiston one, it will consistently offer the greatest specificity without sacrificing brevity. SBL Press strongly prefers the Niese system for that reason. As in the case of all ancient works, if the translation is being quoted, it is appropriate to cite the translator in brackets following the citation. 5. See also Josephus, B.J. 3.506–521 (Thackeray). Alternatively, if the same translation is referred to consistently, a note at the first instance indicating which edition and translation are used throughout the manuscript is appropriate. 8. All translations of Josephus’s Contra Apionem follow the translation in Josephus, The Life; Against Apion, trans. Henry St. J. Thackeray, LCL (Cambridge: Harvard University Press, 1926). The works of Josephus are available through a variety of venues. The Loeb Classical Library (LCL) includes the entire corpus, originally in ten volumes and now repackaged into thirteen volumes (for print editions, see here; for online editions, see here). Brill’s Flavius Josephus: Translation and Commentary series (FJTC) includes, at the time of this post, Contra Apionem, the Vita, and parts of Antiquitates judaicae, with the Bellum judaicum and the rest of the Antiquitates judaicae to come. Whiston’s entire translation is also available freely online via the Christian Classics Ethereal Library and the Internet Archive, and Niese’s Greek text is available freely online via the Perseus Digital Library. Josephus. Antiquitatum Iudaicarum libri VI–X. Vol. 2 of Flavii Iosephi opera. Edited by Benedictus Niese. Berlin: Weidmann, 1888. ———. Judean Antiquities 15. Edited by Jan Willem van Henten. FJTC 7b. Leiden: Brill, 2014. ———. The Life; Against Apion. Translated by Henry St. J. Thackeray. LCL. Cambridge: Harvard University Press, 1926. ———. The Works of Flavius Josephus. Translated by A. M. William Whiston. 2 vols. London: Bohn, 1862.